September 2, 2015, Keelung, Taiwan - Lian-Li Industrial Co. Ltd today announces the PC-V33. Available in 3 choices: brushed aluminum in silver or black, or internal black with a tempered glass side door. The PC-V33 does not restrict PSU, GPU or main board choice due to size or power consumption: it's designed to accommodate full-sized gaming hardware in a compact form-factor. Its cube styling makes it a companion you can take with anywhere you need full-sized computing and still have room for a 240 mm water cooling radiator to be mounted inside. The most unique feature is the canopy top that opens the whole cube for easy building. The newly designed illuminated power button is now made out of the same high grade brushed aluminum as the whole case. The pop-out side doors detach and reattach effortlessly, yet remain firmly in place. The front and top panels form a canopy as a single fold of aluminum, adding strength and beauty to the cube case. When hinged open, the case internals become accessible in the same manner as a test bench, allowing system builders to install the components and change them with ease without any walls in the way. Dual 120mm case fans or up to a 240mm water cooling radiator can fit internally on the front bracket that also holds the magnetically attached air intake filter. 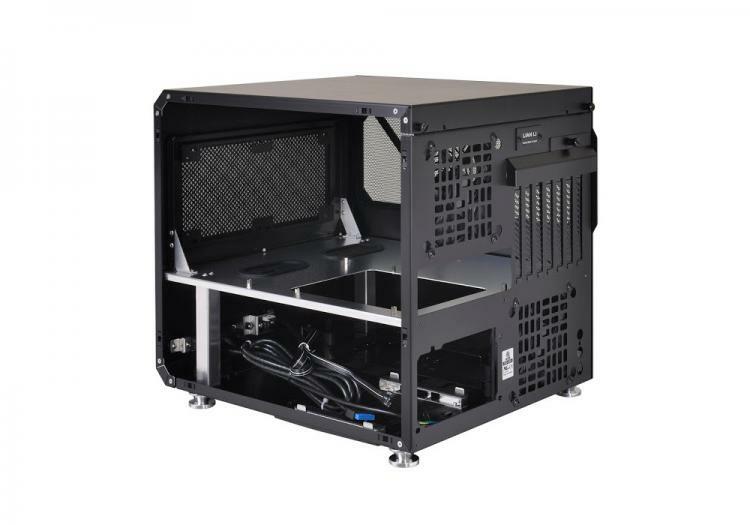 The PC-V33 uses vents and internal compartments to manage heat and dust inside the case. The floor of the main board compartment acts as a barrier so CPU and GPU heat does not affect the PSU or drives. The included 120mm fan vents the top compartment through the newly designed rear vent. The bottom compartment filters air for the PSU that is vented right out the back. The drives have their own 120mm exhaust fan with the aggressive new vent hole pattern. The PC-V33 uses a new drive cage with the same rubber dampening system found in Taipei 101 to eliminate vibrations, ensuring the drives do not produce any noise. This cage can be half removed or fully removed for added flexibility. Horizontal mounting ensures air flow and correct alignment for long life. The PC-V33 supports up to a full ATX motherboard in the top compartment with pre-installed standoffs that fit mini-ITX, mATX and ATX motherboards. It can house CPU coolers up to 190mm in height and VGA cards up to 330mm long. The bottom compartment can fit up to a 300mm long PSU and any combination of 4 3.5” or 2.5” drives on the anti vibration cage. DIY enthusiasts can adjust the interior lighting through the optional RGB lighting kit complete with LED strips, cord clip, dimmer and controller. The rear mounted controller allows instant analog color selection. Guaranteed to fit and show off your custom interior.